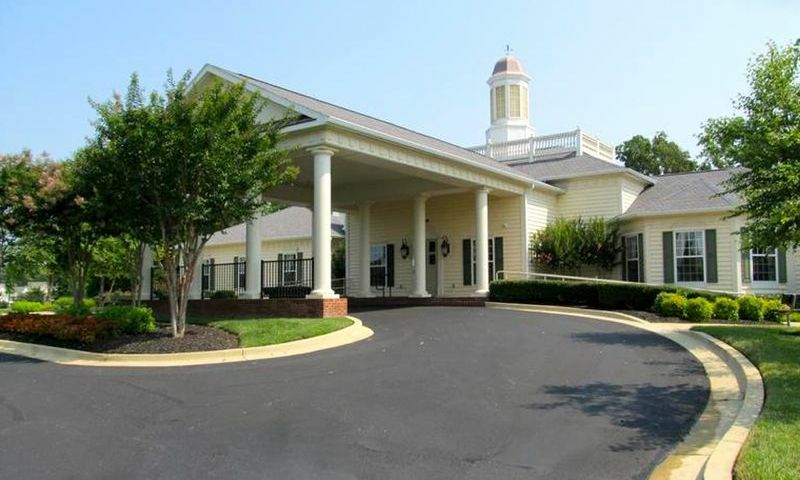 Heritage at St. Charles is an active adult community located in White Plains, Maryland. This 55+ neighborhood is within the master-planned St. Charles community. Heritage at St. Charles offers resale homes with single-level living and spacious layouts. Homeowners in this age-restricted enclave also enjoy a great selection of luxurious amenities that are exclusively for its 55+ residents. Residents of Heritage at St. Charles have private resort-style amenities in a luxurious setting. The clubhouse features plenty of indoor gathering spaces with a card and billiards room, catering kitchen and multi-purpose room. The exercise room is a great place for homeowners to stay in shape. The indoor pool and spa are also great for a relaxing swim or invigorating workout. Residents can meet in the dining room for a meal or enjoy some peace and quiet in the library. A computer room is available to catch up on emails or browse the latest updates on social media. Homeowners can enjoy the outdoors by challenging a neighbor at the tennis courts or they can relax on the patio during the warmer months. The scenic walking and biking trails provide a quiet backdrop to take evening strolls. There are also scenic ponds and plenty of parks and natural spaces so residents can enjoy some fresh air. Construction of Heritage at St. Charles began in 2006 by Lennar Homes and consists of 300 single-family and attached residences. Active adult homebuyers can choose from a variety of resale single-family homes and attached villas that offer elegant standard features and beautiful fixtures. A small amount of attached homes were built in Heritage at St. Charles. These attached villas range from approximately 1,680 to 1,711 square feet of living space. They have two or three bedrooms, two bathrooms, and an attached two-car garage. Some features include spacious kitchens, granite countertops, hardwood floors, and walk-in closets. Heritage at St. Charles also offered single-family homes that range from approximately 1,600 to 3,500 square feet. They have two to four bedrooms, two to three-and-a-half bathrooms, and an attached two-car garage. Lennar offered three floor plans that range in size from 2,058 to 2,249 square feet. These models feature gourmet kitchens with granite countertops, GE stainless steel appliances, spa-like bathrooms with soaking tubs and ceramic tile, and hardwood flooring. Heritage at St. Charles is a great active adult community where neighbors become lifelong friends. Residents can get together at the clubhouse and play billiards or cards, organize a club or plan an activity. They can attend community events or plan offsite trips with other residents. Homeowners can enjoy nearby attractions like the 18-hole public golf course located right across the street. Heritage at St. Charles is ideally located in Charles County, Maryland. The area is close to major highways and offers plenty of options for dining, shopping, and entertainment. There are a couple of parks nearby like White Plains Regional Park and Laurel Springs Regional Park. Residents can shop at Safeway, St. Charles Shopping Center, Town Plaza Shopping Center, and Waldorf Marketplace, which are all a few miles away. Golfers will love having the public 18-hole White Plains Golf Course located just across the street. Long distance travel is easy with Ronald Reagan National Airport that can be reached in about 45 minutes. Heritage at St. Charles has all the amenities and convenient location that cater to the 55+ homebuyer in White Plains, Maryland. There are plenty of activities available in Heritage at St. Charles. Here is a sample of some of the clubs, activities and classes offered here. A small amount of attached homes were built in Heritage at St. Charles and they are available on a resale-only basis. These attached villas range from approximately 1,680 to 1,711 square feet of living space. They have two or three bedrooms, two bathrooms, and an attached two-car garage. Some features include spacious kitchens, granite countertops, hardwood floors, and walk-in closets. Please Note: Floor plans are not available at this time. Heritage at St. Charles offers new and resale single-family homes that range from 1,600 to 3,500 square feet. They have two to four bedrooms, two to three-and-a-half bathrooms, and an attached two-car garage. Lennar currently offers three new floor plans that offer 2,058 to 2,249 square feet of living space. They feature gourmet kitchens with granite countertops, GE appliances, spa-like bathrooms with soaking tubs and ceramic tile, and hardwood flooring. Please Note: Not all floor plans are available at this time. 55places.com is not affiliated with the developer(s) or homeowners association of Heritage at St. Charles. The information you submit is distributed to a 55places.com Partner Agent, who is a licensed real estate agent. The information regarding Heritage at St. Charles has not been verified or approved by the developer or homeowners association. Please verify all information prior to purchasing. 55places.com is not responsible for any errors regarding the information displayed on this website.